Particularly successful in the United States, the 1985 children's book If You Give a Mouse a Cookie doesn't offer much in terms of material to adapt. Written by Laura Numeroff and illustrated by Felicia Bond, it's a simple tale of a boy who gives a cookie to a mouse he finds in his house, and then finds himself asked for a glass of milk to wash it down, scissors to trim the mouse's hair, a bedtime story, and so on. The book was so successful that it's generated fifteen sequels and a recent animated version on Amazon. Produced by the Manhattan Theatre Company – although the acting company consists of two Scots (Kamen Brown and Imogen Reiter) and an English actor (Sarah Haddath) – this version stretches the original tale out, and plays it for slapstick laughs and silly fun. The glass of milk is a character in itself, for example, while the slightly odd decision to have both Reiter and Haddath play the mouse does give rise to an amusing mirror scene. At 45 minutes, the very simple thread of the original tale is diluted somewhat, but the show works well as an engaging dose of visual fun for smaller children. Assembly Rooms, until 25 Aug, 10.30am, £6–£9. 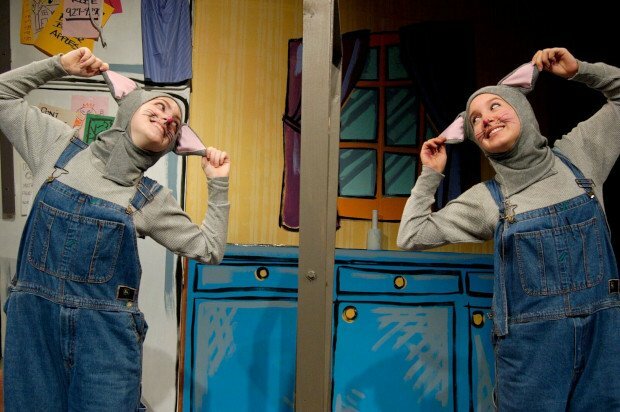 A play about the joys of parenting and a surprise encounter with a hyper, hungry mouse, based on the best-selling series of books by Laura Numeroff.